The fate of admitted Boston Marathon bomber Dzhokhar Tsarnaev now rests in the hands of the jury of seven women and five men. On Monday, Tsarnaev's attorneys and the government put a final point on the evidence, testimony and arguments made over the past month. Jury deliberations are set to begin Tuesday morning. Defense attorney Judy Clarke said, "We don't deny that Dzhokhar participated in these events, but if not for Tamerlan it would not have happened." 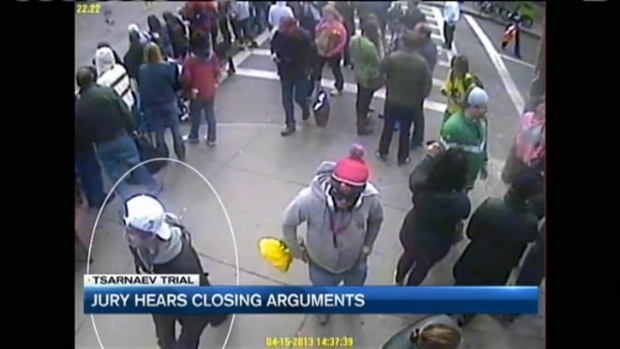 Clarke reminded jurors that they admitted right in the beginning in opening statements that Dzhokhar, 21, carried the backpack with the bomb in it onto Boylston street, saying "it was him." She said Monday, "there is no excuse, no one is trying to make one"
But the government alleged the defense is trying to deflect blame. Assistant US Attorney Bill Weinreb said, "Don't be distracted by what the defendant did versus what his brother did, they were partners." 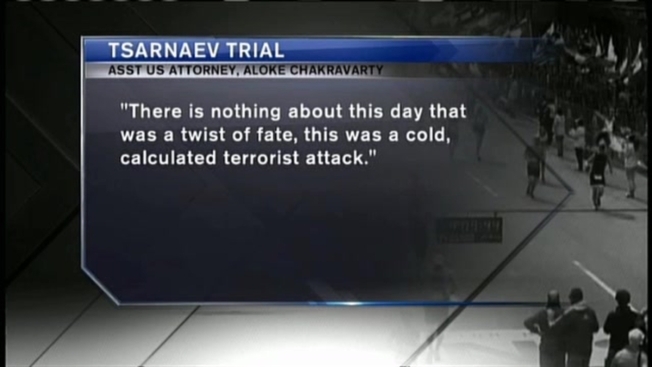 And AUSA Aloke Chakravarty focused on what he said was Dzhokhar's decision to place the bomb behind the Richard family killing 8-year-old Martin and maiming his 6-year-old sister Jane. "He slung his backpack over his shoulder like a college student. That day they were soldiers...and they were bringing their battle to Boston." "It was a heavy bag, the decision must have weighed on him...all the places he could have placed this bomb, he placed it right here (behind the Richard Family). Jane was 6 years old when the defendant tore the leg from her body." The jury is expected to begin deliberating Tuesday morning, almost two years after the twin bombings near the finish line of the Boston Marathon killed three people and wounded more than 260. It was the nation's deadliest terror attack since 9/11. Prosecutors used their closing argument to remind the jury of the horror of that day, showing photographs and video of the carnage and chaos after the shrapnel-packed pressure-cooker bombs exploded. In one video, jurors could hear the agonizing screams of Krystle Campbell, a 29-year-old restaurant manager who bled to death on the sidewalk. As for the youngsters killed or maimed by the bomb that was in Dzhokhar's backpack, Chakravarty said: "These children weren't innocent to him. They were American. Of all the places that he could have placed the bomb, he placed it right there." Tamerlan Tsarnaev, 26, died four days after the bombings after he was shot by police and run over by Dzhokhar during a getaway attempt. Dzhokhar was captured hiding in a dry-docked boat. At the end of his closing argument, Chakravarty displayed photos of those killed in the bombings and the Massachusetts Institute of Technology police officer who was shot to death during the getaway attempt. "They are no longer with us," Chakravarty said. "This is the result of the defendant's choice to be a terrorist, his choice to make a statement. These were choices that he was proud of." Clarke struck a conciliatory tone in her closing argument, admitting the attack brought "tragedy, suffering and grief in dimensions that none of us could imagine were possible." But in a strategy clearly aimed at saving Tsarnaev from the death penalty, Clarke said Tamerlan played a much more prominent role, buying bomb components, including pressure cookers, BBs and remote control parts. She said Tamerlan researched via computer how to build the bombs and planned the attack. And his fingerprints — but not Dzhokhar's — were found on pieces of the two bombs. "We're not asking you to excuse the conduct," the defense attorney said, "but let's look at the varying roles."